Don’t accept less for your child! We all know how important it is to have your child participate in a fun, safe, educational camp. 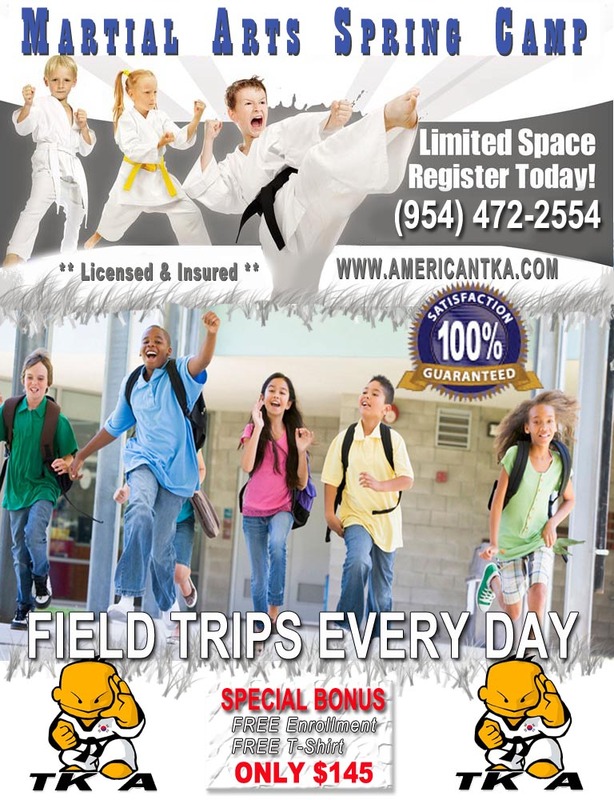 American TKA Universal Martial Arts offers all this and more in our Martial Arts Spring Camp for children ages 4 to 15. Our camp offers a wide range of age appropriate games, crafts, sports, field trips and educational activities. The goal of our camp program is to allow the campers to have fun in a safe atmosphere while learning respect, self confidence, discipline and focus. The campers will be involved in many fun activities that stimulate creativity, develop teamwork and leadership skills, and allow everyone to enjoy the thrill of success. Our dedicated, professional staff is focused on providing an exciting and safe environment for all of our students. We pride ourselves on providing a fun atmosphere that is focused on personal growth for each student. Our program is well staffed with career martial arts instructors, senior staff members, program managers, and assistants. Each staff member has experienced the positive impact that the martial arts can have on a student, and we strive to help each student grow physically, mentally, and emotionally. When you enroll your child in our “TKA Kids After School and Spring Camp Martial Arts Program” we’ll provide more than just quality care. We’ll teach your child martial arts. Call today at (954) 472-2554!